It's come to this. There's now a show in South Korea in which people with plastic surgery have more work done so they can look like they did...before plastic surgery. Called Back To My Face, the recently debuted South Korean television program features individuals who have had more than ten procedures done. So far, the show's debut apparently got good ratings and considerable media attention. Courtesy of tipster Sang, you can see a preview for the show. Here are the before and after photos for some of the individuals that appeared on the show. Back to My Face catalogues the work each of them have gotten over the years. The show is branding itself as "reality makeover show," concentrating on the therapy aspects. During one counseling session, the participants drew pictures of themselves. In another segment, one participant took to the streets and asked people what they thought of her pre-plastic surgery photo. As reported on South Korean news sites (also via Sang), the guests then decide if they want to have reconstructive surgery to remove implants or other work they've had done. So, for example, this guest decided not to "Stop" and not go through with the surgery. This gentleman, however, did. On the right, you can see what he looked like after he had the reconstructive work done. Note that this isn't a complete reconstruction. Here is what he looked like before he had any plastic surgery. She also decided to get her face back. 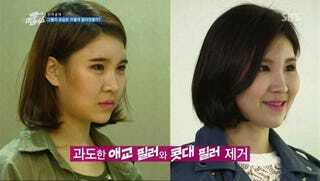 Above, you can see how she looked with plastic surgery compared with reconstructive surgery. And here is a comparison of what she looked like before she had plastic surgery and after she had reconstructive surgery. The thrust of Back to My Face seems to be that you should be happy with yourself—which is certainly an admirable message. However, asking people who gotten lots of facial work if they want, well, more seems a bit like pouring gasoline on a fire. I'm not therapist. Maybe it works. I honestly don't know.